One of my closest friends is PaleOMG owner, founder, CEO, choreographer, and athlete, Juli Bauer. Homegirl can COOK. Therefore, many of my foodie inspirations will come from her. This first meal in the “Cooking with Smashby” segment is one of those meals. Breakfast was probably my most often neglected meal, and as most of you semi-intelligent people know, it is also considered by many to be one of the most important meals of the day (if not THE most important). I only say “semi-intelligent” because I consider myself to be at least semi-intelligent. And I had heard that fact about breakfast many times. Yet, as someone who trains hard every day to try and get in good physical shape, I STILL chose to ignore this fact. Day after day, year after year, I would just skip breakfast. That’s just dumb. 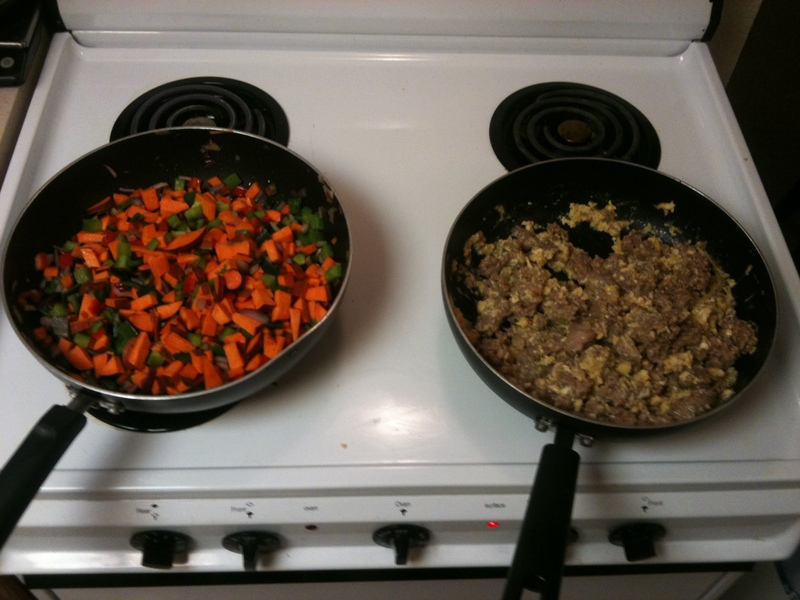 And with that, the BREAKFAST SCRAMBLE was introduced to me! It’s a super-simple recipe that usually makes enough food to last me at least half-way through the week! That means I went from not eating breakfast at all, to eating almost everyday, with only 30-ish minutes of work. Win. There you have it, less than 10 ingredients. My kind of recipe. Cut up the peppers into small enough pieces for you to enjoy them. I, am a baby, so I cut them into small pieces so I don’t have to say “yucky, that was a big piece of pepper.” Also cut up the sweet potato to your preference of size. I’d recommend cutting them smaller since they’ll cook faster that way. Toss a little olive oil (nope, don’t care about measuring) in a pan, add ground sausage at a medium temperature. Let the meat begin to brown. Here where you’d add salt and pepper “to taste”. Throw the veggies and sweet potato in another pan and let those start to cook (also at a medium heat). The calm before the storm! Veggies and meat cooking separately. Stir both meat and veggies separately (using a different spoon since one pan has raw meat in it, bro… Not trying to make you sick here). 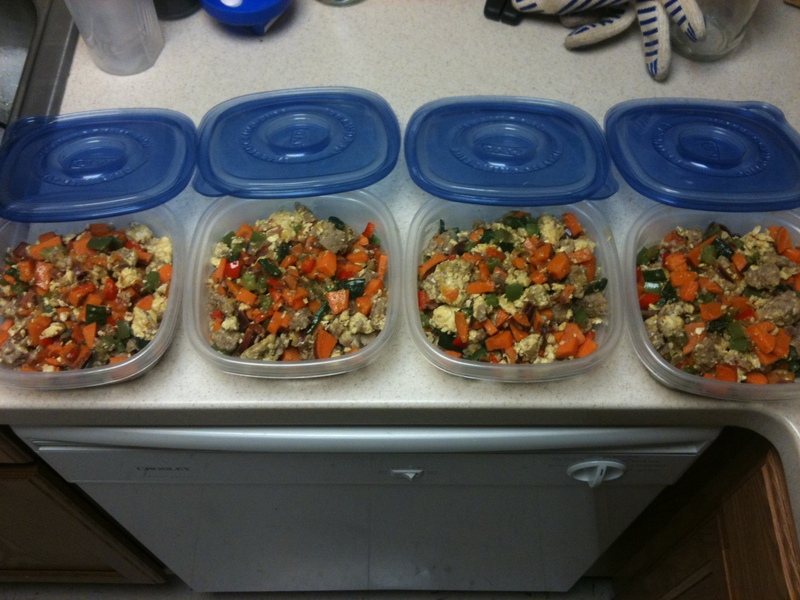 The goal is to get the veggies to the softness of your liking, and the meat to almost fully cooked. Once the meat is about done (meaning there is barely any pink visible), add your eggs to that pan! Yep.. Just crack whole eggs in there and start stirring away! 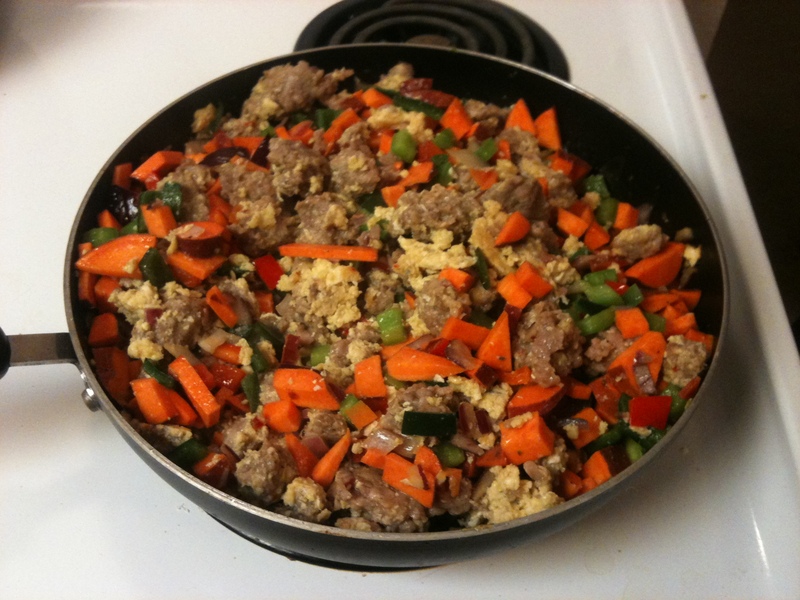 When your meat and egg magic is just about done, dump allll of the veggies into the protein pan. Toss in some crushed red pepper flakes to add a little zing to it if you’d like. Combine those bad boys and stir away! This is the storm. A bit aggressive in the pan, but it worked! When it all looks nice mixed, let sit for a few minutes, separate out into your tupperwares, store in fridge for easy morning microwaving. That’s it!! And this meal is DELICIOUS. With the ingredients listed here, that would probably make about 3 big portions, or 4 slightly smaller ones. Not bad at all for less than 30 minutes of work. So, there you have it, Recipe #1 is in the proverbial books. What’d you think?! Let me hear it, friends! I am going to make this tonight!!! Also just a tip for anyone reading…Costco has a great deal on plastic containers/Tupperware sets…I forgot what I paid but they are quality and the best price I found anywhere. Thanks for the head’s up, G-Dub!! Go buy your tupperwares! I used PaleOMG’s egg-on-the-go bites. I truly don’t know how I lived without them for so long! She is amazing. And I want her body. Hopefully one day I will look like that. I am so hungry right now. If it wasn’t 10:30 I would burpee long jump to Whole Foods to fetch the ingredients missing from my refrigerator. The good news Vance, is that all of those ingredients will still be there tomorrow! Rest up, and burpee away then instead… You’ll be safer in the daylight.